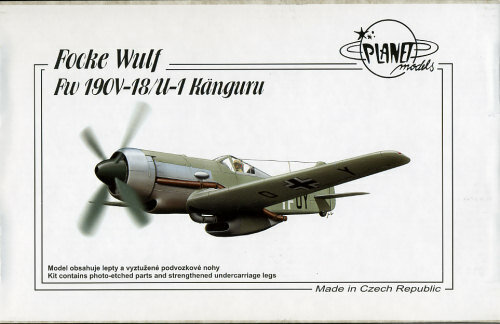 In 1942, the RLM requested Focke-Wulf to build a high altitude version of its FW-190. The FW-190B was the result, but found to be unsuccessful, mostly due to the engine chosen. Designers then turned to the newly developing DB 603 and Jumo 213 engines, which held more promise. The DB 603 aircraft was the FW-190C and the Jumo 213 version was the FW-190D. Several different prototypes were built to use the DB 603 engine and that included the v 13, 15,16, 18, 19 and 29 through 33. A considerable effort indeed. The main difference was in the version of the engine used and other equipment. One of the first with a turbocharger was derived from a FW-190A-0 airframe and used a four bladed prop. This turbocharger was driven by engine exhaust and mounted below the fuselage in a very large housing, giving the aircraft the nickname of 'Kangaroo'. This aircraft also had a pressurized cockpit requiring a reinforced canopy. The torque of the engine required an enlarged fin/rudder, looking very much like that of the late war Ta-152. Though the aircraft did reach a top speed of 608 KPH at 11,000 meters, continuing problems with the turbocharger and pressurization caused the project to be terminated. This particular kit arrived in a sturdy cardboard box with its contents packed in the now-standard multi-sectioned bag. Small bits were in an additional bag within, adding additional protection. Detail is excellent with lightly engraved panel lines and rivet detailing. I found none of the usual molding glitches that are so common on other resin kits. Only a tiny bit of flash and some sprue stubs will need to be removed to get the parts ready for use. The kit includes strengthened undercarriage, molded in a black material. I can't tell if this is wire reinforced resin or perhaps some other sort of plastic, like standard polystyrene. Regardless, it is good to have some less pliable material as the weight of the kit would cause distortion of normal resin in a short time. Two well done vacuformed canopies are provided. 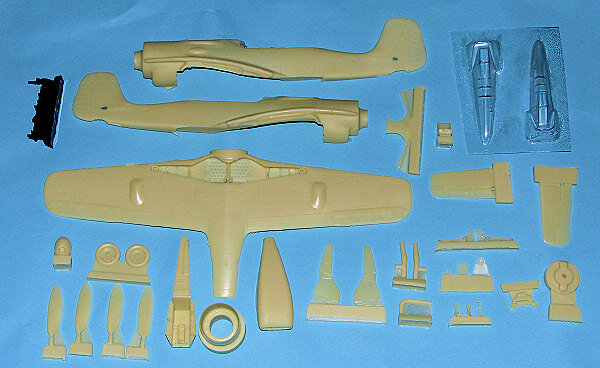 A small etched fret with rudder pedals, seat belts and oleo scissors, to name a few items is included. No etched instrument panel, which would have been nice, but really, little can be seen in the cockpit of a 190 anyway so additional detailing would pretty well go unnoticed. Instructions are a single sheet of paper with history and parts list on one side. The other has three large photos with five smaller inset photos of the kit. This approach works well with one has a lot of space, but I found that the addition of the part numbers to make things rather busy and somewhat difficult to follow. This might be a case where well done line drawings w ould be preferred. Decals are for the lone prototype and are well printed by AviPrint. The aircraft was apparently in RLM02 over most of the airframe with the engine sections in unpainted aluminum and some RLM 74 on the upper wings. The only photos I've seen of the plane do not show the upper wings, so this cannot be verified by me. I was also wondering about the various gun hatches being present on the wings. A set of drawings I found (see reference link) shows them, but from the images, it is not easy to determine if they were present or not (see photo). The box art definitely shows no under wing cannon hatch. This is a great looking kit and sure beats the heck out of the older RV Resins version. It is one that would be a fine introduction to doing full resin kits. I've had a lot of success with Planet Models and I'm sure this one will not be any different. It is already on the workbench so look for a full build review in the near future. 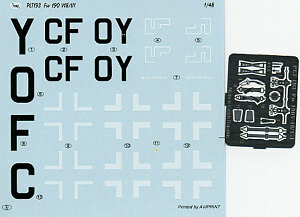 My thanks to www.coopersmodels.com for the review kit. You can get yours by visiting his website.